A Forgotten Hero is the true story of Folke Bernadotte's heroic rescue of 30,000 prisoners during WWII. In one of the most amazing rescues of WWII, the Swedish head of the Red Cross rescued more than 30,000 people from concentration camps in the last three months of the war. Folke Bernadotte did so by negotiating with the enemy—shaking hands with Heinrich Himmler, the head of the Gestapo. Time was of the essence, as Hitler had ordered the destruction of all camps and everyone in them. 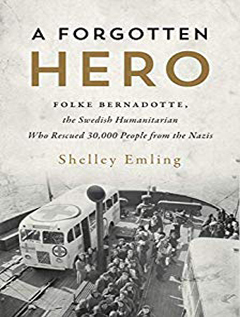 A Forgotten Hero chronicles Folke's life and extraordinary journey, from his family history and early years to saving thousands of lives during WWII and his untimely assassination in 1948. A straightforward and compelling narrative, A Forgotten Hero sheds light on this important and heroic historical figure.